Gold medal winner and world record holding Paralympian, Baroness Tanni Grey-Thompson DBE, presented 18 catering apprentices and trainees with their graduation certificates at an awards ceremony this week. Each one of the apprentices and trainees has a disability and the qualifications, were gained through a specially created scheme run by Unity Kitchen, the social enterprise arm of disability charity, the Camden Society. Over the last 12 months 6 apprentices from Unity Kitchen outlets have worked in all sections of its busy cafes at Tooley Street, Firepower, Flapjacks, and Timber Lodge at the Queen Elizabeth Olympic Park. They have been learning the essentials skills needed for their chosen careers. Some excelling in customer service whilst others demonstrated their culinary flair, all essential ingredients to ensure customers are happy and that the apprentices achieve their Level 2 NVQ Diploma in Hospitality Services. They also attended Westminster Kingsway College one day a week to achieve their functional skills qualification. Unity Kitchen is also celebrating the achievement of its 12 trainees from New Horizons, Firepower, Café 311 and Jacksons Cafés. They have achieved a Level 1 or 2 NVQ Diploma in hospitality Services. The apprentices are currently making career plans with the support of The Camden Society’s employment teams. All will get support to search for jobs and apply to vacancies to build their careers. Yeliz Dizman from Enfield graduated from The Camden Society’s Café 311 Café in 2014 and successfully applied for an apprentice chef position at Unity Kitchen Cafe and Events at the Olympic Park. She has proved to be a great asset to the team demonstrating great flair and speed at one of the social enterprise’s busiest cafes. Yeliz successfully completed a two week work experience placement at the 5-star Waldorf Hotel in May 2015 and has recently achieved her Level 2 award in food production and cooking. Southwark-based Marcus Luchman graduated from Lewisham and Southwark College’s catering course in 2013. He works one day a week at Rhubarb & Custard Café, Lewisham. He went to apply for an apprenticeship at Flapjacks’ café in Camden. Marcus has great customer service skills. He completed a 2-week work experience at Ottolenghi’s production kitchen in Camden Town, and completed Level 2 Award in food production and cooking in July 2015. Marcus is actively job-seeking. He has been for a number of interviews and has been offered two positions. The Camden Society is working with him to make some choices and find a job that meets his skills. Adam Biggs from Greenwich is an apprentice chef at Unity Kitchen at the Firepower Museum in Woolwich. He had already completed a Level 1 award in cooking but was determined to take the big step and attempt a Level 2 in food production and cooking, which he achieved in July this year. He successfully completed a two week work experience placement at Casa Grande, making fresh pasta and tweeting about his progress! Adam has recently got a new job at the Royal Parks – Greenwich Pavilion café. “It is an honour for me to be presenting the certificates to the apprentices and trainees. It is important to celebrate their achievements and they can be proud to know that they have met the high demands of the scheme and have come through it with flying colours. 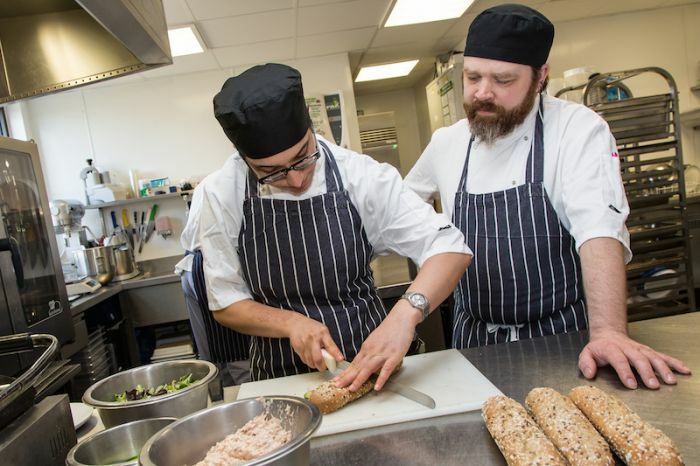 Unity Kitchen is a pioneering scheme in the way that it allows those with learning disabilities to get into the industry. Be the first to comment on "Paralympic legend presents disabled apprentices with catering awards"